U.S. Geological Survey Scientists: Harvey E. BELKIN, Robert B. FINKELMAN, and Peter D. WARWICK, hbelkin@usgs.gov, 956 National Center, U.S. Geological Survey, Reston, VA 20192. Peoples Republic of China Scientists: ZHENG Baoshan, Institute of Geochemistry, Chinese Academy of Sciences, Guiyang, Guizhou Province. ZHOU Daixing, Autonomous Prefecture Anti-Epidemic Station of Southwest Guizhou Province. Determining the relationship between releases of hazardous substances into the environment and the effects on human health is a challenging responsibility. Such investigations are often hindered by lack of knowledge regarding the nature and origin of the dangerous material and the pathways and timing of exposure. Although domestic coal combustion for heating and cooking is very minimal in Europe and North America, such use of coal is common in China and India and may involve some 1 billion people worldwide. China has abundant and widespread coal resources. Domestic coal combustion is common in rural and in some urban areas of China. We are engaged in a collaborative program between Chinese and American public health and earth-science researchers to address the specific occurrence of arsenosis and fluorosis related to domestic coal combustion in southwest Guizhou Province, Peoples Republic of China. Domestic combustion of coal for residence heating and food preparation is pervasive in the mountainous regions of this Province. Approximately 10 million people in this area are impacted deleteriously; mostly from coal-burning related fluorosis. Figure 1. 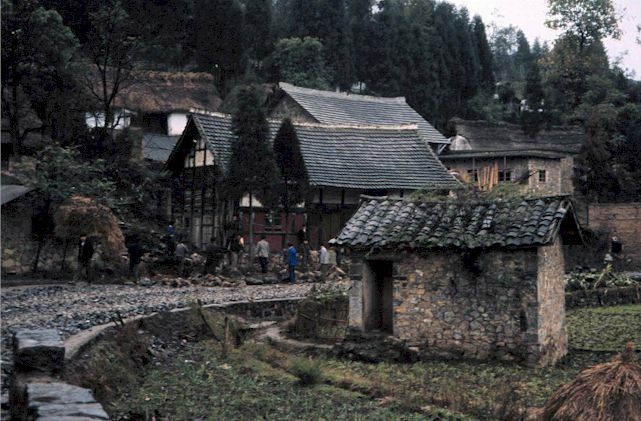 Typical scene in southwestern Guizhou Province. Zheng Baoshan, Research Professor of Geochemistry, has for many years been actively involved in research that considers the links between human health and geology. Approximately 15 years ago, he started conducting research on the occurrence of arsenic and fluorine poisoning in Guizhou Province. Dr. Zhou Daixing, a geochemist working for the provincial public health department, has been conducting long term and extensive research on various human health issues in southwest Guizhou Province related to earth science causes. It is their pioneering research that this collaboration seeks to extend and amplify. Southwest Guizhou Province is underlain by an extensive thickness of upper Paleozoic and lower Mesozoic sediments. The Permian, although aerially much less extensive, contains coal-bearing argillaceous sediments (Longtan Formation) that crop out related to fault or fold structures. Figure 2. Typical village in study area. The predominately rural population in this mountainous region uses coal for residence heating and food preparation including drying of food stuffs over open, unvented fires. The coal in some parts of this region is extraordinarily enriched in As, Sb, Au, Hg, etc. The use of high-arsenic (>1,000 ppm; some 3 wt.%) coals has caused in excess of 3000 cases of arsenic poisoning in several villages. The primary path of human introduction appears to be through ingestion of foods dried and stored in chimney less dwellings. 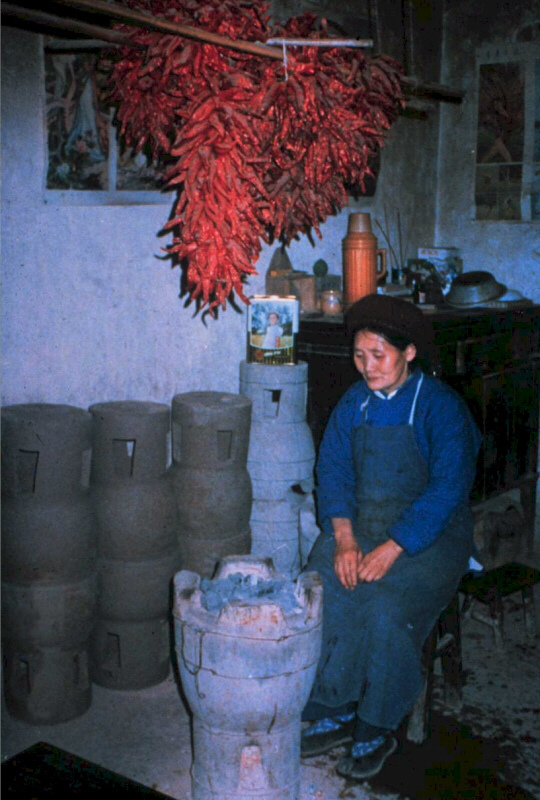 For example, the drying process using open coal stoves, increases the arsenic content of chili peppers from background levels (<1ppm) to as much as 500 ppm. The selective absorption of As by chili peppers may be related to the high sulfur content of the pepper. Chili peppers, although native to Bolivia and Peru, were introduced into China about 350 years ago by the Portuguese. In the region of high-As coals, chili peppers are a staple of the local diet. Figure 3. Inside home drying chili peppers. 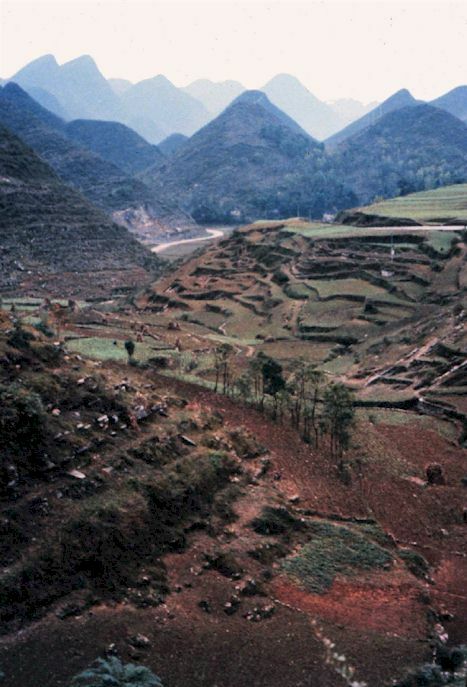 Southwest Guizhou Province is also the site of extensive, albeit small-scale, gold mining from discontinuous sediment-hosted (Carlin-type) gold deposits. Where we have examined known high arsenic coals, gold is being actively mined. The gold deposits in some areas tend to be fault controlled and in other localities the gold deposits are associated with an unconformity at the base of the coal-bearing Longtan Formation. The paragenesis of these Carlin-type gold deposits is deposition by solutions carrying extensive amounts of As, Hg, Tl, and Sb and various other elements. It is reasonable to relate the origin of the high As coals to the same crustal fluids responsible for the gold deposits. Figure 4. 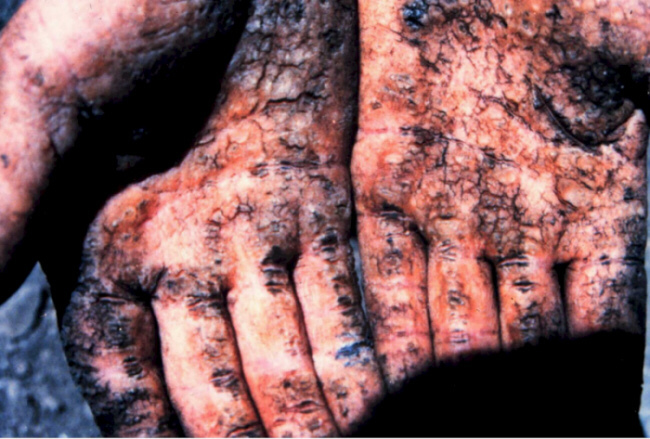 In certain villages people with a very high body load of arsenic show dark, crusty skin on extremities termed keratosis. The organic-rich Longtan Formation provided the necessary change in redox conditions for chemical precipitation to occur. The coals contain a wide variety of As3+ and As5+ -bearing minerals and in the coals richest in As (and S), the organic matter is suffused with organically bound As5+. Figure 5. 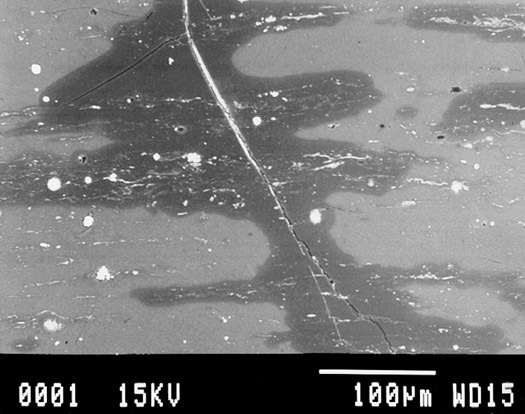 Scanning electron microscope back-scattered image of arsenic-enriched coal. The As content in this sample is approximately 30,000 ppm. The milky areas are the As-rich areas; the bright areas are low-As, sedimentary pyrite. The structural complexity of the area and gold-As-rich coal association suggests that coal zones containing high As are probably as irregular and discontinuous as the gold deposits. The local public health officials have instituted a program of testing the coal being mined for high concentration of As. This is a very important aspect of public health but the discontinuous and varied nature of the As-rich coal zones suggests that this program will require constant monitoring. of this admixture is known to exceed 10,000 mg/kg in some areas. The primary path of human introduction of fluorine is also related to drying food in chimneyless dwellings. In this case, preliminary studies indicate that corn preferentially adsorbs fluorine from fluorine-rich coal smoke. The distribution of coal-related fluorosis is more much extensive than coal-related arsenic poisoning. Our collaborative studies related to this problem are just beginning. Recent collaboration with Dr. J. David Robertson, University of Kentucy, has provided us with whole coal fluorine contents using a PIGE technique. The coals range in concentration from 80 ppm to 2400 ppm F. Many coals contain in excess of 300 ppm F. Average US coals contain about 120 ppm. Work is in progress to try and identify the fluorine bearing phases and to evaluate the clay mixed with the coal as a source of F.
Future Collaborative studies with Chinese counterparts. A Memorandum of Understanding is being established to formalize the collaborative efforts especially in health issues related to earth science. As part of an exchange program, Associate Professor, Ding Zhenhua, Institute of Geochemistry, Guiyang, will visit the Reston and Denver USGS locations for six months beginning in the spring of 1999.